That’s a pretty good nutritional profile. Here are the health benefits of turkey based on this nutritional profile. The health benefit of turkey is numerous. While the list below is not complete it will help you realize that turkey should be a key part of your weekly nutrition. 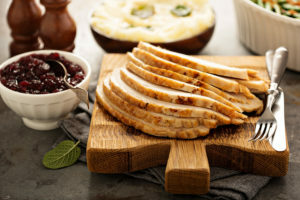 Protein is key to your overall health and turkey is a great source of concentrated protein. Proteins are used by your body to make enzymes, hormones, and other chemical compounds for optimal metabolism. And protein is a key building block for bones, muscles, cartilage, skin, and your blood. Niacin or vitamin B3 has been used since the 1950s to treat high cholesterol levels. Specifically, niacin lowers LDL (bad) Cholesterol while helping to raise HDL (good) Cholesterol. And it helps to lower triglycerides, which may prevent heart disease. Niacin can also boost brain function, benefit your skin, and may help to reduce the symptoms of arthritis. Pyridoxine or vitamin B6 has been shown to improve mood and reduce the symptoms of depression. This means that it helps to promote good brain health. Plus it works with iron to prevent anemia. For pregnant women it has been shown to be helpful in treating nausea. And vitamin B6 may be helpful in reducing the risk for heart disease by preventing atherosclerosis. Like vitamin B6, vitamin B12 helps to prevent anemia since it’s a key part of proper red blood cell formation. Additionally, vitamin B12 supports bone health to prevent Osteoporosis. It aids in reducing your risk for macular degeneration. And it can help to improve your mood while lessoning the symptoms of depression. Vitamin B12 aids in energy production. Magnesium is a key mineral that works with calcium to maintain the health of your bones while preventing osteoporosis. Magnesium is critical in proper heart muscle contraction. And it has been shown to help lower high blood pressure. Magnesium also aids in digestion to help the good bacteria of your small intestine properly break down food for nutrient absorption. Like phosphorus I could do a separate article on the health benefits of zinc. So here is a quick overview. It’s the second most abundant trace mineral in your body with iron being the most abundant. What makes zinc so critical to your health is that it’s required for more than 300 enzymatic processes in your body. It’s needed for the proper metabolism of carbohydrates, fats, proteins, nucleic acids, and other mircronutrients. And zinc plays a role in immune functions, wound healing, cell division, blood clotting, and thyroid function. According to Dr. Mercola the health benefits of selenium are numerous especially in the prevention of chronic diseases associated with inflammation. As a powerful antioxidant it helps to prevent free radical damage, which typically results in cellular inflammation. Plus, selenium has been linked to the prevention certain types of cancers while also boosting your immune system. And selenium is needed for proper thyroid function. The glycemic number associated with turkey is usually zero or 1. The glycemic number associated with food represents its effect on your blood sugar. The higher the glycemic number the greater the effect that food has on increasing your blood glucose or blood sugar. This means that turkey is an excellent food source for all diabetics as it will not affect your blood glucose numbers. And when you examine all the other health benefits listed above, turkey can be a key nutritional source in helping to prevent diabetic complications. Well, that’s a good summary of the health benefits of turkey based on some of its nutritional components. And while I didn’t cover everything, I’ve covered enough to help you realize that turkey needs to be a consistent part of your diet. Not just on holidays.